David Frank spent his professional career in the City. He joined Slaughter and May in 1977, became a partner in 1986, and in 2001 he became the Firm’s first Practice Partner. 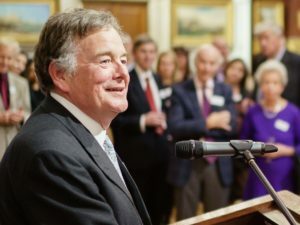 Since retiring in 2008, David has developed a portfolio of charitable interests in Surrey and is Chairman of the Royal Alexandra and Albert School. He became Chairman of the Community Foundation in 2013. David plays a vital and very active role in the Foundation, sitting on and chairing our working groups and supporting Staff and Trustees to guide the Foundation’s development.